A mixed medium bicycle ride to benefit the New England Bicycle Racing Association. Thank you for your interest in NEBRA's August Adventure. Unfortunately due to time and venue constraints we have elected to cancel this years ride. 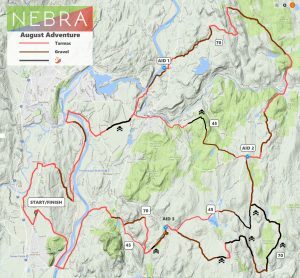 Below is the 2017 route map- you can also find the Cue sheet for NEBRA MAX August Adventure 2017, and the GPX file for the route here.